Announcement Thank all of you who have been praying and keeping in touch with us during this time. We are looking at heart surgery. My husband is an only child, so, we are the sole caretakers of his mother. Outstanding order will be filled and then I will have to take a break until we get her back on her feet.. If you are awaiting an item for a specific date or occasion, please contact me if I do not already have the information so I can make sure I have all orders out for you. Thank you for your patience. Thanks for shopping with me! Everything is made by me in my shop ~ Please read and understand my turnaround times. You may ship sooner, but during the busy holiday season, expect longer turnarounds. ~Scroll to the bottom of this page for more information on the process of making your garment, how long it will take to receive your handcrafted garment, sizing information, and shipping details. ~Browse around and if you have any questions at all please don't hesitate to convo! ~Wholesale? Send me a copy of your resale certificate and your first order, and I am happy to discuss wholesale opportunities. All Bulk Wholesale is made to order and because of the amount ordered it may take longer to ship wholesale items. Thank you for your understanding. Thank all of you who have been praying and keeping in touch with us during this time. We are looking at heart surgery. My husband is an only child, so, we are the sole caretakers of his mother. Outstanding order will be filled and then I will have to take a break until we get her back on her feet.. If you are awaiting an item for a specific date or occasion, please contact me if I do not already have the information so I can make sure I have all orders out for you. Thank you for your patience. This line began with just a request for a little blank Jon Jon from our main line and request after request, grew and grew. 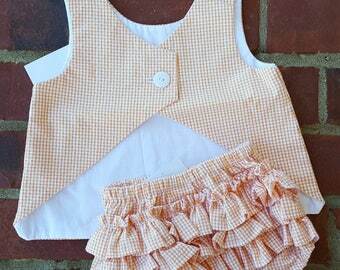 Now I offer tons of different variations and fabrics of sweet little southern style wear for little boys and girls. With over 30 years of children's sewing and designing experience, I design patterns for every style children's clothing apparel. Using only the finest of fabrics and with 780 sq ft working space, machines, cutting tables, 100's of bolts of fabric in stock, let me design your custom line or make something special for you! Special request are always welcome and if you don't see a fabric on the site, just ask I just may have it here in inventory. Thank you for shopping with me! I love working with shops on designing their own line of clothing. Contact me if you are interested in developing your own line. Please scroll all the way down for information on ~ shipping times ~ size charts ~ and other detailed information. Thank you. Mistakes on my part will be taken care of promptly! I apologize in advance, but from time to time I do make mistakes. I do not offer refunds at this time. Exchanges are perfectly fine on unworn~unwashed~unaltered items. Buyer is responsible for shipping on exchanges. Payment upon your purchase. TN residents must pay sales tax. For all other states that Sales tax is now required, Etsy will add it on and collect. Handmade special order items please see our front page for turnaround times as they can frequently change especially during holidays. Turnaround times are noted as to ship by dates on your order. This date should be the latest your item will ship, It can ship sooner. If you are in need of something faster, please consider adding rush to your order. Many Items listed in the store are now made and listed. They are ready for immediate shipping. RTS will be included in the title of the listing for items that can be shipped immediately. Browse around and if you have any questions at all please don't hesitate to convo! I appreciate your business. If you are on a deadline or need your item by a particular date, It is important that you put the date you need it in hand in the notes to seller box when checking out. If you need your item anytime within 2 weeks and my shipping schedule is longer, I do offer rush options. Rush is required for me to work extra to get your outfit out without pushing my awaiting orders back further. During heavy ordering times Rush will not be available. Please feel free to convo with me on your specific needs and check my front page for up to date shipping times. I always suggest hand washing and hanging to dry. Your item may also be machine washed and line dry. I do not suggest ironing seersucker, as the seersucker/ripple may flatten. Corduroy and Pique ~ Iron with care. Low Heat. I suggest using a teflon iron shoe plate on your iron to prevent scortching and shining of fabrics. However, you should always test in an inconspicuous area first as all irons vary. Handmade special order items please see our front page for turnaround times as they may change frequently. Scroll down towards the bottom of this page for actual times. Turnaround times are noted as to ship by dates on your order. If you are in need of something faster, please consider adding rush to your order. Many Items listed in the store are now made and listed. They are ready for immediate shipping. Ready made items listed in my shop RTS will ship next postal pickup after payment. Approx. Preemie - 24m 2.5"
Waist: 7" extends to 10"
Middle Back to Middle Bottom: 8 1/2"
Waist: 8" extends to 11"
Middle Back to Middle Bottom: 9 3/4"
~Wholesale? Send me a copy of your resale certificate and your first order, and I am happy to discuss wholesale opportunities.